The Afghan Pir Khan Lodi, entitled Khan Jahan, rose to power under Jahangir and became one of his most esteemed amirs. In 1625 he was made governor of the Mughal territories in the Deccan. However, he endangered his position and reputation when he let himself be bribed by the Sultan of Ahmadnagar, the Nizam Shah or Nizamulmulk, to cede part of the regions entrusted to his governorship. Khan Jahan fell completely out of favor with Shah-Jahan when he failed to support his succession to the throne. Despite the fact that Khan Jahan suppressed the first rebellion of Jujhar Singh Bundela in 1629, at the beginning of Shah-Jahan's reign, he was recalled from his post as governor of Malwa to Agra. Seeing no way to avert his downfall, Khan Jahan fled the court on 15 October 1629 and joined by several other defectors, made his way through Bundela territory to the court of the Nizam Shah at Daulatabad. Khan Jahan's defection put Shah-Jahan's rule to its first great test because 'nearly all the tribes of Afghans from the bank of the rivers Nilab and Indus to the confines of Kabul and the surrounding countries' were prepared to acknowledge the rebellious Afghan as their leader. 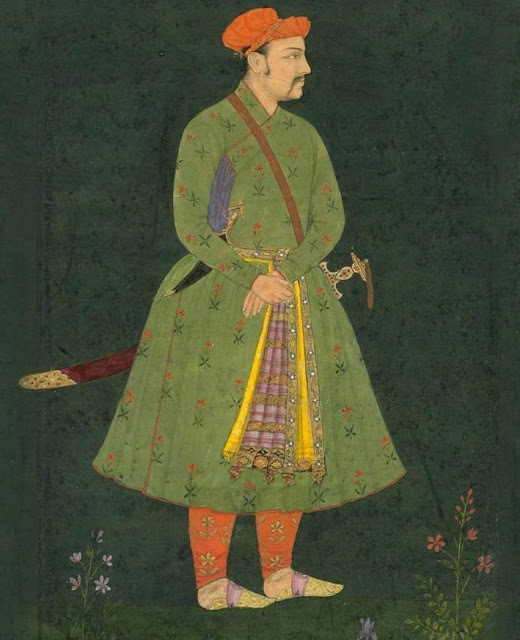 The Mughals were, however, able to suppress this uprising at Peshawar and to deal successfully with the Nizamshahis in the Deccan campaign which Shah-Jahan supervised personally from Burhanpur. When the Mughal forces closed in on Daulatabad, Khan Jahan and his followers became distrustful of their ally, the Nizam Shah, and set off towards the north, 'hoping to achieve something in the Punjab with the assistance of the Afghans.' They were hotly pursued by a detachment of Mughal troops. 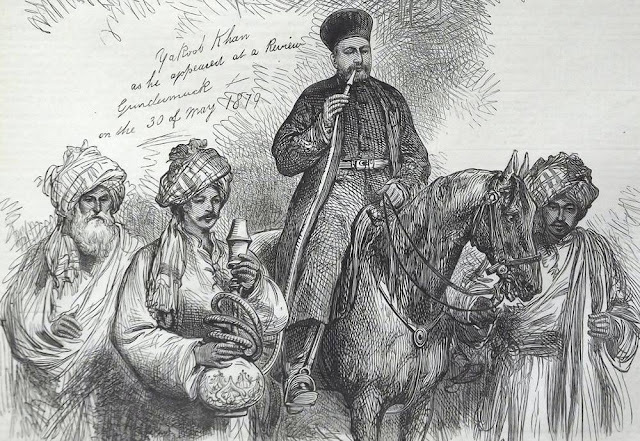 When the Afghans passed through Bundelkhand, Bikramajit, the eldest son of Jujhar Singh Bundela who had previously assisted Khan Jahan in his flight from Agra, wanted to atone for it and attacked the Afghans. Khan Jahan's companion Darya Khan Daudzai was killed and his head sent to court, for which Bikramajit received the title Jagraj ('Lord of the World'). Khan Jahan managed to escape but his flight finally came to an end at Sahenda (Sihanda), north of Kalinjar, where his Mughal pursuers advanced towards him on 3 February 1631. The Afghan fought valiantly but was killed in action, many of his men perishing with him. The heads of Khan Jahan and of his son Aziz Khan were sent to the court at Burhanpur, where Shah-Jahan had them mounted on the gate of the palace as a warning. The court poet Abu Talib Kalim composed appropriate verses to commemorate the event, and Khan Jahan's captors, Abdullah Khan Firozjang and Sayyid Muzaffar Khan Barha, were suitably rewarded; Khan Jahan's title went to the latter. Mahesh Soni depicts the moment when the royal mace-bearers sever the head of Khan Jahan from his bound body. It appears as if the renegade loses his life at this moment, though in reality he had been cut to pieces earlier in the engagement with the Mughals. 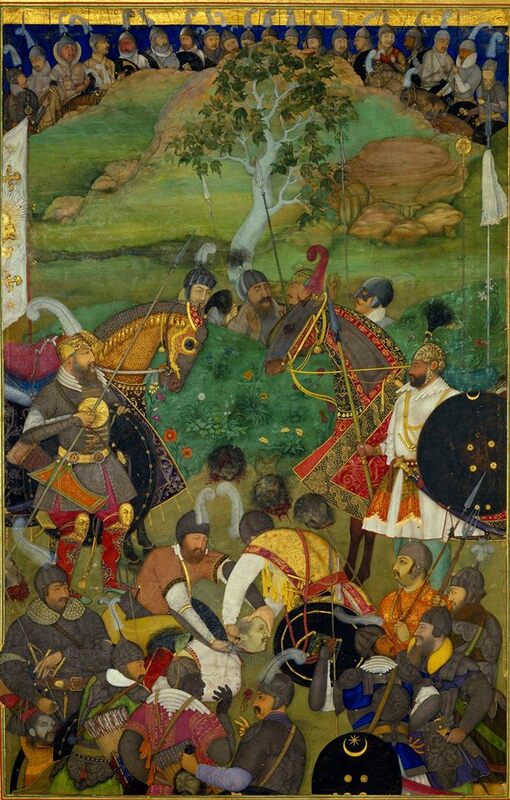 The heads of his son and followers are lying on the ground; two more heads of slain Afghans are held by Mughal officers among those who watch the main scene. The leaders of the Mughal force, Abdullah Khan and Sayyid Muzaffar Khan, have dismounted their richly armored horses to preside over the action. The Rajput whose head is emphasized below the dismounted horseman on the right is Madho Singh Hada, younger son of the Rajput Rao Ratan Hada of Bundi. (It was a spear thrust from Madho Singh that killed Khan Jahan Lodi.) 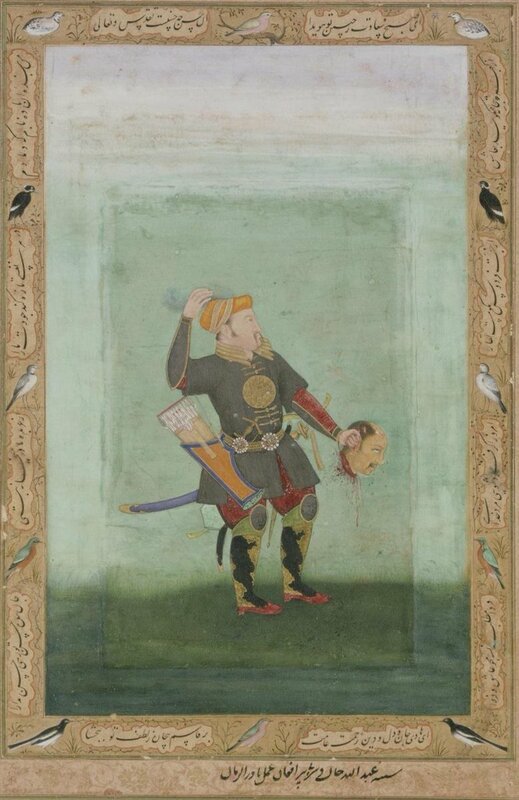 Abdullah Khan Firoz]ang, the other horseman, became famous for this act of beheading, and a series of portraits showing him holding the head of Khan Jahan Lodi are known. 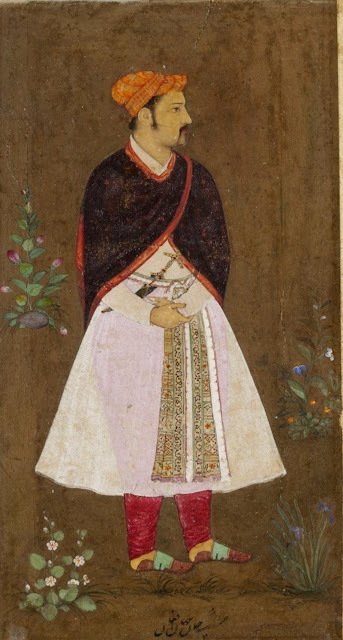 Portrait of Khan Jahan Lodi, circa 1670.